UnitedPeople would like to increase Garda rural numbers and further look to re-opening some rural stations. Providing safety to citizens has boiled down at too many times, to just financial reasoning above practicality. Lives should be considered priceless and precious. Sadly, our government says different all too often. UnitedPeople would like to re-address the imbalance in favour of the citizen. There has to be increased procurement of what on the ground, is needed by Garda to tackle burglaries and other serious crimes. Upon a concise report compiled from all levels of Garda operations and reviewed, UnitedPeople would increase procurement and installation of those additional requirements, to create greater successes for Garda in rural and urban crime roles. We recognise that the pay and conditions of Garda, especially at the lower levels, is poor. This should and would, be improved. They have been previous taken advantage of, used as political fodder by elected acting poorly. A watchdog section with real 'teeth' to investigate and question, would be created to oversee that political interference to affect operations, instigate them or use them to underhand advantage, is not operating covertly or by proxy. This body would report bi-annually to the public directly, not to their elected representatives. Taking into standard considerations where secrecy is needed to maintain ongoing operations, the Garda should be free to public report any questionable situations arising in their day to day operations. The Garda exist to protect people, their livelihood and their property first – not be used by through actions of elected, to bias aid big business toward further profit potential - as in through their usage, in order to back-up elected legislated bullying, example; water meter installations. Lets get our Garda back to what they signed up to do as new recruits - tackle crime and prevent it - not be used by others elected, as a business means to a profitable end! We would instigate greater legal clarity to cease any undue political interference towards Garda in their day to day duties that also might involve their duty to detect and prevent white and blue collar crime. Like SIPO (Standards In Public Office) who's powers would also be legislation increased, the Garda would be greater empowered to investigate matters of concern, when their awareness of such matter could be inspired through information gained during day to day operations. Through increased, constant, all level, Garda communication in Ireland and other successful foreign institution of similar nature, UnitedPeople would further instigate what’s needed to tackle gangland crime. Further legislation changes would be looked at where needed, to also make this happen. UnitedPeople recognise that Garda moral, for one reason or other, has been devastated. This has got to change. We would look at ways to turn this undercurrent tide. A poor motivated Garda service, is not one that can operate at needed higher levels of success. By helping our Garda, in the end, we also help ourselves. We are talking here about further job assistance where needed including legal clarifications regarding tort law - not just criminal law. We would see to it that further financial assistance for individuals struggling, is available. In short, we would create new and other tested successful methods, to assist those putting their lives on the line for the nation, every day. Greater legal powers for the Standards In Public Office (SIPO) would be provided (possibly with increased Garda cross participation). Their ability to investigate political related crime or questionable activity would be more enhanced. Those that might also have something to hide, would fear such abilities being improved. The increased usage of imposed curfews and area restrictions would more looked at - along with stiffer penalties for those that would break such court mandated restrictions. 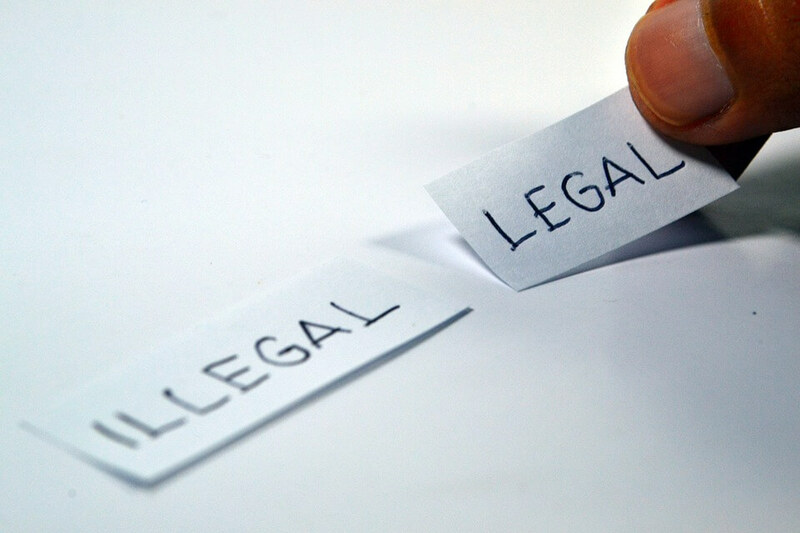 Where there is clear justifiable suspicion of individuals or groups operating against an area or person, both can be court ordered to adhere to time (to be assessed) restrictions, away from said area or people. Criminal law would be enhanced to include more secondary knock-on consequences of culprit actions. For example if a victim later dies (test case: from heart attack later due to culprit created stress - where otherwise it can be shown none would have higher existed under normal victim living circumstances), becomes injured or their rights are also violated as outlined under the Non-fatal Offenses Against The Persons Act 1997. The task of updating fathers rights (still unequal with women's rights) is an aim of UnitedPeople to balance out. There must be equality constitution enshrined in every aspect. Anything less, is legalised unfair discrimination. The constitution has to be updated also in regard to basic rights access, to internet access and the ability to seek out alternative information sources. This currently not a major issue in Ireland at the moment. UnitedPeople is aware however, when dictatorial governments worldwide attempt to silence or fool populations through their own propaganda media, same governments attempt to deny to its citizens, internet access in total or in extreme censored form (Twitter, Facebook, news sites and more denied). To safeguard Ireland citizen rights, UnitedPeople, thinking ahead of future possibilities, to protect citizens further, would instigate further fair constitutional safeguards in favour of guaranteed open access to alternative opinion and news. Further constitutional clarification that the citizens presently retain ownership over Ireland natural resources and ownership of town/county services involved in their distribution, is needed. Through public bodies, UnitedPeople would seek to solidify legally as having the primary right to maintain control in the public interest. Safeguards would be put in place to ensure that quite state tendering would not become a back-door route to sly privatisation of same services and resources. 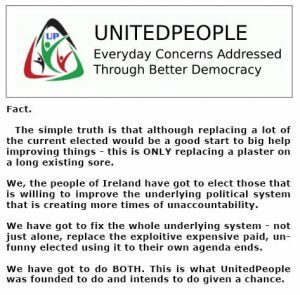 UnitedPeople would seek to create and then pass by Dail Bill, further clearer and stronger legislation. We would do this also in regard to the protection of Ireland's natural environment. A precautionary principle, default position would be stronger legal affirmed over demands and lobbying of private business, including industrialisation and construction industry. UnitedPeople would create the necessary legislation to ensure that workers are not involuntary forced to accept government work schemes that leads to a situation where their hourly work earnings rate,, does not fall below minimum wage levels. We seek a legal end to any considered exploitative state work schemes where any or all conditions is not on par with standard employer/employee accepted status. Create a state "Savings Investment Deposit Account" to encourage people to save for retirement (account to be treated the same way a pension plan is treated). UnitedPeople would look into creating a national bank service for the public, to further this direction. The bank’s network could be built on the current existing post office/credit union networks. This in turn, could further safeguard current employed within state sectors and further increase employment numbers. All savings would be further state guaranteed. When it comes to creating further honesty through transparency, greater ease of access by the public to recorded department details, relating to state expenditure would be increased. During 2009 and 2014, not one cent in corporation tax was collected on earnings amounting to almost €17 billion. In 2014, 68% of companies paid no corporation tax at all. Part of the reason for this is genuine tax relief available to companies. However, it's suspected that a proportion of these companies are exploiting the tax system still, despite reportedly (they claim on paper) making no taxable profits. its is unfair on SME's to be further suffering tax burden when larger companies have the powers and skill to possible evade possible more due, tax payments. UnitedPeople would like to re-address this possible unfair imbalance through enacted legislation to close more current tax loop-holes. 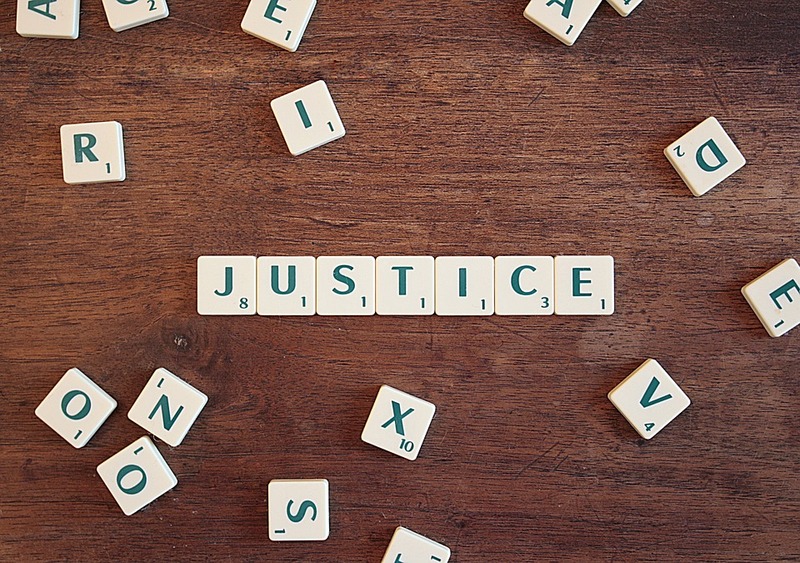 To enhance better oversight of national bodies such as NAMA, UnitedPeople seeks the instigation of stronger legal protections against possible questionable trading. This includes covert and open under-selling and any actions akin to insider trading by elected ministers and those possible working for them in any departmental capacity. all would be far more accountable through improved defined legislation. As with other areas that poor governments has interfered with, to the advantage of private individuals connected to elected and private companies, legislation would be enacted in protection toward successful pension schemes. Greater legal ring-fencing would be enacted to ensure greater state protections from undue political interference. A higher state of emergency would be defined in order to see that such funds could only then be re-directed after open and rigorous democratic procedures are followed through with. Absolute guarantees of reimbursement and within a definite time-line, must be adhered to or any involved individuals, could be held further accountable. UnitedPeople would like to address the still ongoing SME issues surrounding insurance, business rents and over-bearing wage inflation. These continue to hamper local community business growth - which in turn could aid Ireland young (and older) into staying within Ireland's borders in attempt to seek work. “Trillions of tiny pieces of plastic are accumulating in the world’s oceans, lakes and estuaries, harming marine life and entering the food chain. A single shower can result in 100,000 plastic particles entering the ocean." 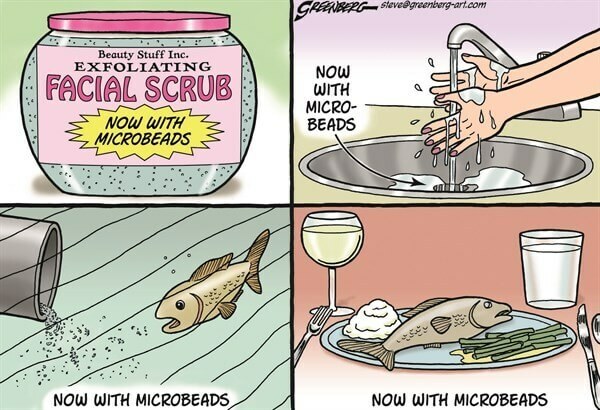 As microbeads are non-biodegradable, this makes them harmful to all forms of wildlife and ecosystems. Other countries have already banned them or are at stages of phasing them out. UnitedPeople believes that Ireland should for good reason, take a similar action as soon as possible. Environmentally, it's the right thing to do for future generations. UnitedPeople fully support the Simon Communities of Ireland aim, to see that heavy governmental 'red tape' is phased out in order to help solve Ireland's housing crises. We would call upon such charitable organisation to show where in government operation it would be better to urgently remove such red tape. There is a growing widespread belief that this hurdle prevents homeless people from securing a more permanent place to live. with more than 6,500 people currently living in emergency accommodation, this matter needs to be quickly addressed. state bureaucracy continues to create substantial barriers for people to find a way out of homelessness. This is simply not good enough, during any economic crises or not. THE ABOVE IS ONLY A BEGINNING. WHAT IS ABOVE IS ONLY A SUMMARY. IT IS UNITEDPEOPLE STARTING OUT TO ADDRESS MANY IMPORTANT AREAS. WE ARE WORKING THROUGH LISTENING, MORE ON WHAT CITIZENS HAVE TO SAY AND ARE EXPERIENCING. UNITEDPEOPLE CONTINUES TO EXAMINE AND SEEK OUT NEW RESOLUTIONS.